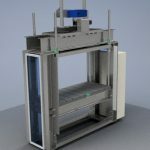 Cambridge Dynamics specialize in the design and manufacture of bespoke/ special purpose machinery and control systems, as well as the improvement of existing production facilities and processes. Cambridge Dynamics has been designing and building special purpose machinery since 1978. During these 38 years we have amassed a large store of knowledge and experience developing a wide range of machines across a diverse array of applications, including a 120 ton forming press which weighed in at 16 tons (see K2 Press in case studies for more information). With today’s advances in technology almost anything can be automated with Custom Machinery, which is designed and built completely to your requirements. Standard machinery often cannot perform all of the tasks needed, resulting in multiple machines having to be purchased. 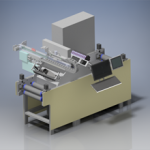 A custom machine can be designed to do multiple functions within one machine. With standard machinery you are often paying for costly unnecessary features. Whereas you can specify your exact options and extras in custom machinery. Custom machines are built to integrate with other existing machines in your production process, this means installation is often a lot quicker, minimizing downtime. Custom machinery is often simpler to use (even if it is doing a more complicated processes) as it is tailored to your exact requirements. At Cambridge Dynamics we meet with you to discuss your requirements and will include you throughout the complete design, build and installation process. A well-built custom machine will require minimal maintenance by the manufacturer. Cambridge Dynamics offers a service plan which can include maintenance, remote support and 24 hour on-site support depending on the level of cover you choose. Installation of custom machinery is often far less disrupting to your business operations than installation of standard ‘off the shelf’ machinery. The reason for this is that custom machinery is designed and built while keeping in mind the need to integrate this into the rest of your production process. Therefore when a custom machine is installed, it has already been designed to fit in with your current production layout and there is only minimal install needed to integrate it with your process. Standard ‘off the shelf’ machinery will often require on-site modifications to enable it to be integrated into your process, therefore causing greater disruption to your business operations during install. Staff training is something that is always necessary whether you are installing a custom machine or standard machinery, but with a custom system the user interface is tailored to your exact requirements making the training quicker and the system far easier to use. At Cambridge Dynamics staff training will be included. At Cambridge Dynamics all custom machinery is built to comply with the relevant directives and CE markings. Your legal responsibilities when buying new machinery for use at work are outlined in the HSE buying new machinery guide, which also mentions that ‘When buying a custom-built machine, you can use this opportunity to work with the manufacturer to help them design out the causes of injury and ill health’. At Cambridge Dynamics our engineering consultant will evaluate your proposed project and advise you on the cost of the custom machinery and will also be able to advise you as to whether you can expect to see increased throughput and less defects as a result of installing custom machinery. 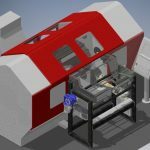 What is the life cycle of custom machinery? As with any other machine, the life cycle of bespoke machinery depends on many factors but a typical custom machine that is well built and maintained properly will last for at least 5 years and often 20+ years.